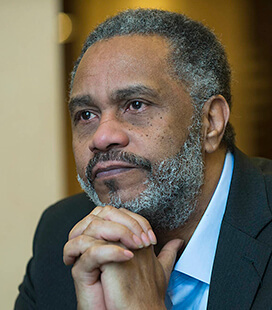 Lecture: "From Death Row to a Life of Freedom"
The Exoneration Project, American Constitution Society, Federalist Society, and Klau Center welcome Anthony Ray Hinton, an Alabama man who spent 30 years on death row for crimes he did not commit. Mr. Hinton will speak at Notre Dame Law School about his wrongful conviction in 1985, his years on Alabama’s death row, and the experience of freedom. Lacking adequate legal defense, no ballistic analysis was conducted until 2002, when qualified firearms experts testified that the bullets from all three crimes could not have been fired from Mrs. Hinton’s gun. “I’ve never had an apology, but I forgave those involved in my conviction long before I left prison,” Mr. Hinton has said since his exoneration. “I didn’t forgive them so they can sleep well at night. I did it so I can.” Mr. Hinton will be available after the talk to sign copies of his book, “The Sun Does Shine,” copies of which may be purchased at the event. Co-sponsored by the Department of Africana Studies, Kellogg Institute for International Studies, Kroc Institute for International Peace Studies, and Rooney Center for the Study of American Democracy.